The word “capitalism” was coined by the socialists, often used as a pejorative, and has historically described a system of state-granted privilege and plutocracy. This is the definition to which most people subscribe, and which I would argue prevails today. A contrary definition is one that is synonymous, or nearly synonymous with “free markets”. My best guess is that this “definition” is a the result of a revisionist attempt to hijack the term “free markets”. In one sense, “free market capitalism” may be viewed as a system in which individuals make voluntary arrangements involving the exchange of capital. Although Wurst does go further with this definition (every imaginable transaction) it’s silly and sloppy to put emphasis on “capital” when (and I think he’d agree here) a truly free market is a “system in which individuals make voluntary arrangements involving the exchange of goods and services (i.e., not limited to “capital” but also to include non-capital goods, labor, land, etc.). Unfortunately, this definition of the term has never been widely accepted, and to this day 99 out of 100 people would probably not even come close to approximating this elegant definition. In another sense, “free market capitalism” may be viewed … as a phrase combining words interpreted via historical realities and implications. In other words, “free market” implies voluntary arrangements, whereas “capitalism” has become (rightly so) known as a system in which business and coercive state forces collude to serve whatever arbitrary interests may be lobbied for by the businesses or championed for reasons of power by the politicians. Words have meanings! And in order to have any meaningful, relevant definition, words must be “interpreted via historical realities and implications” regardless of whether we like them. Whereas the former definition sloppily suggests that the properties of “free markets” dominate the term and carelessly ignores the historical and popularly understood definitions of “capitalism”, the latter definition is much more precise in defining both terms separately. Additionally, Wurst admits that this definition is the one that is popularly held, and as the language belongs to the people and their common use, I see no reason to pretend that it means something else. So why bother trying to apologize for “capitalism” when “free markets” are what you (and I) really wish to obtain? That is, if you really do believe in “free markets”, then you should probably distance yourself from the word “capitalism”. If it’s a free market, it’s not capitalism. And if it’s capitalism, it’s not a free market. Those of us who believe in free markets need to stop trying to save the word “capitalism”. If anything, we need to save “free markets” from “capitalism”, because the two should never have been joined. I am not sure you can disassociate markets from capitalism in this way. Just as it is not possible to disassociate Liberty from capitalism. 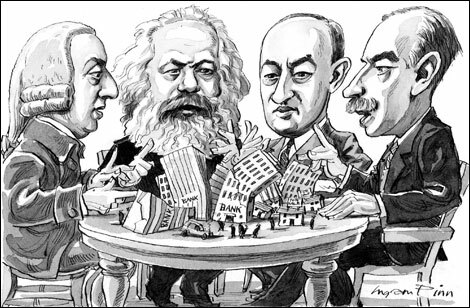 The development of capitalism is precisely the disintegration of pre-capitalist social forms. The slave, for instance, did not haggle with his master over his subsistence share of the social product. The market in labor power is, by far, the largest single market in any economy presently, and this market deals in the purchase and sale of the quintessential capitalist commodity. I understand the reluctance of libertarians to be associated with capitalism, but this reluctance will likely have to extended to markets as well. You are still trying to salvage the word “capitalism” which was invented as a dirty word, and still is to most people today (except for American libertarians who have a tendency to treat the terms as interchangeable). I’m willing to concede that capitalism may represent an improvement over feudalism or other earlier socio-economic arrangements. This does not imply, nor does it necessarily follow, that capitalism is synonymous with free markets. I agree that the word “capitalism” does not very well reflect the “voluntary arrangements involving the exchange of goods and services”. Plus it does sound I dunno… a bit stupid: “capital-ism”. I can also agree that, on many occassions, the use of the term “free markets” along with its adjunct “..in goods and services” has more clarity than the term “capitalism”. However, I think the use of “capitalism” and the use of “free markets” ought not to be considered merely interchangeable, but dependent on context. Yes words mean things, but I’m regularly dealing with people to whom the word “capitalism” has been genetically-engineered by way of association and implicature in their article and editorial diet to subsume a host of other referents – including, for example, money, production and economies of scale. Seriously – I sometimes get them asking me questions (as rhetorical questions) like “why do we need money?”. In other words, when such people pour scorn on “capitalism”, they are not just attacking the overly narrow definition that you and I might agree to stipulate to over a cup of tea and a biscuit, but a plethora of associated values. Were I to discard the term “capitalism”, I would still need to defend many of these other associated things anyway. For that reason, I would prefer to defend “capitalism” under the qualifier that it is “free market capitalism” as opposed to “state-leveraged” or “state-managed” capitalism. Perhaps I’m making a hash of it, or perhaps your proposed change in terms may make more sense in some situations than in others.